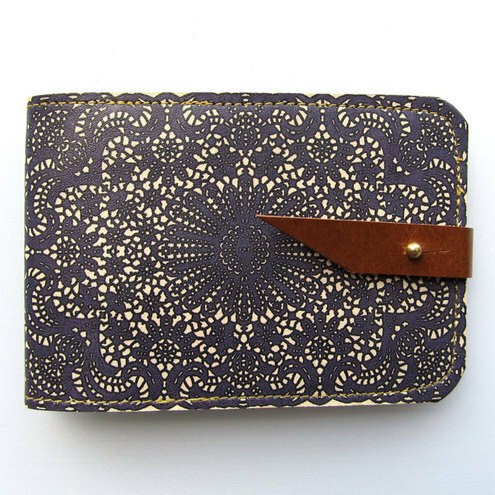 Folksy :: Buy "Leather card case/ Oyster card holder - Purple lace"
These are our new card cases for Spring/Summer 2011 !! This smart little card case/holder is great for when you only need your cards and not your bulky purse or wallet. It has 4 compartments for cards, notes etc and has a secure strap to keep the case from opening up in your bag or pocket. The beautiful, original artwork is printed directly on 100% leather. Folksy :: Buy "Leather coaster set (x4) - Deep Purple lace design"
Folksy :: Buy "Leather ipod, itouch, iphone cover - Lace"
Folksy :: Buy "Small Zipper Pouch Coin Purse Fandango Flowers "
Folksy :: Buy "Leather iPhone / iTouch/ HTC (desire/mozart) Case - Lace"